Leo team will inform NEW Support Policies since 2016. At Leo Theme, we want to ensure that you are totally satisfied with our services. If you face with any technical or sales issues, please contact us. Our developer will support you about technical issues and Marketing team will answer all your questions. Customer is God. To meet customer demand, we have to run Services Program Open sources such as Shopify Prestashop ,Wordpress, Opencart and Magento for Prestashop. It aims to help you complete the project as quickly and professional. Leo Theme is one of the Head Company in this field over 10 years. 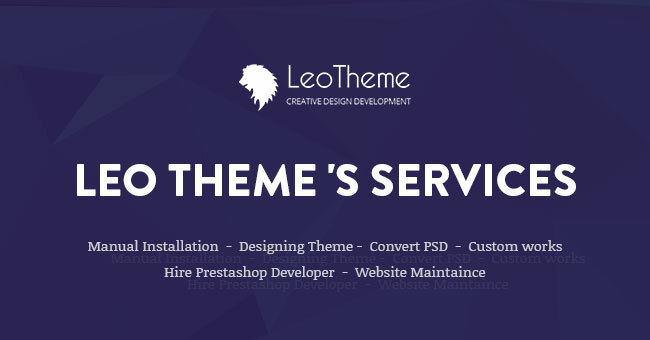 Leo Theme has many years of experience in web development. We produce high quantity Templates and Services that can be used as a basis for fast and high quality website. Leo Theme’s reputation were known widely, with professional working style we build trust from customer around the world.